Papua New Guinea is a fascinating country that I’ve always dreamed of exploring. I finally had the opportunity to visit this past September, and it was an experience I’ll never forget. The views were breathtaking, the people were incredibly welcoming, and immersing myself in the culture by participating in local festivals was priceless. Touring Papua New Guinea in September was ideal, as the country’s weather patterns make some months better for travel than others. Keep reading to learn the best time to visit Papua New Guinea! Papua New Guinea’s low season takes place at the same time as the wet season. During the months of December through March, travel is not popular, and many tour groups and trekking expeditions are unavailable. These are the rainiest months, with high temperatures and high humidity. The highlands are typically a bit cooler, but temperatures generally climb to 90 degrees. The downpours lead to washed-out roads in the highlands, and traveling is neither comfortable nor easy. However, if you’re big on surfing, the wet season brings the best waves to the north coast and islands. The shoulder months of April and November are a good option for those looking to score deals on flights and accommodations. These months are transitional and see less rain than the wet season. However, weather remains hot and humid, and rainfall can be unpredictable. When it comes to diving, conditions are great year round, with clear visibility and warm waters. The only exception is Milne Bay, which has its best visibility from September to January and April to June. The country’s dry season is its high season for travel—this is the best time to visit Papua New Guinea. Since the country has a tropical climate, it stays hot and humid all year long. However, temperatures slightly cool along the coast and lowlands during the dry season; you can expect temperatures in the low 80s, as opposed to 90s. July in particular is the coolest month, and the highlands cool significantly. Although it’s called the dry season, the climate is never truly dry. During my stay in September, I was very fortunate to experience a stretch of sunny days. But towards the middle of my trip, rain showers became more frequent. If you want to hike the Kokoda Trail or watch for wildlife, now is the perfect time. Another reason the dry season is so popular is because it’s when the majority of festivals take place. When I arrived in mid-September, I got to watch Goroka’s Sing Sing Festival, honoring the country’s 43rd year of independence. I was mesmerized by the locals’ traditional dress, songs, and dances. I also traveled to Simbai for the Kalam Festival, where five boys were initiated into men through traditional rituals. 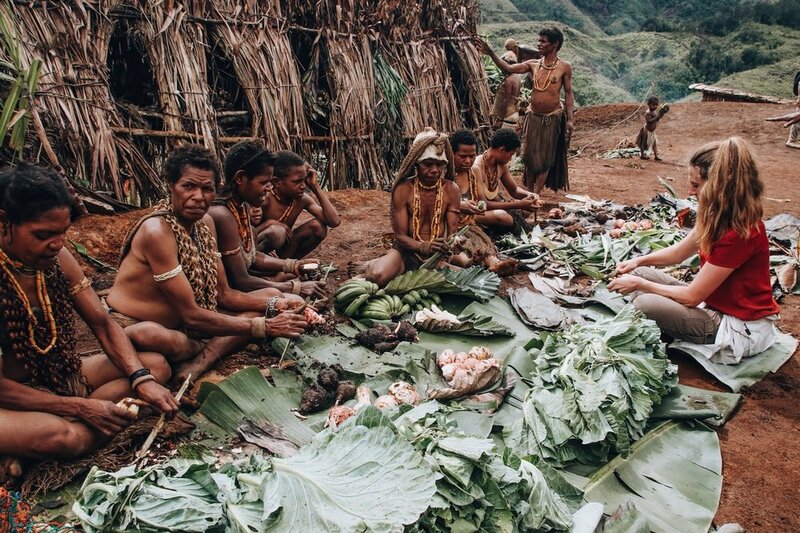 To learn more about my time in Papua New Guinea, check out my daily travel journal on my blog. Newer PostOlivia Caridi, Sarah Herron, and Kylie Take on Morocco!